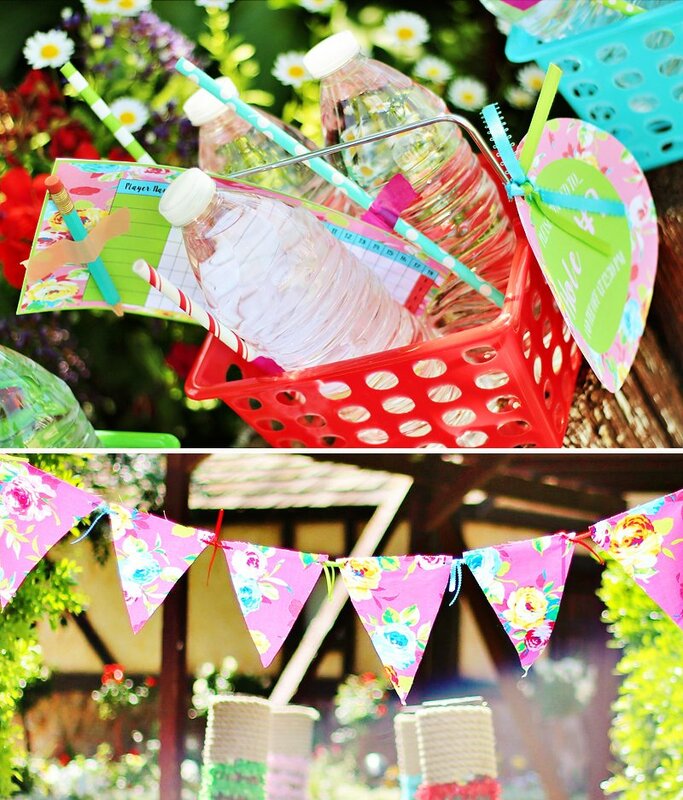 Now how’s THIS for a cute idea: throw a ParTEE for ChariTEE! 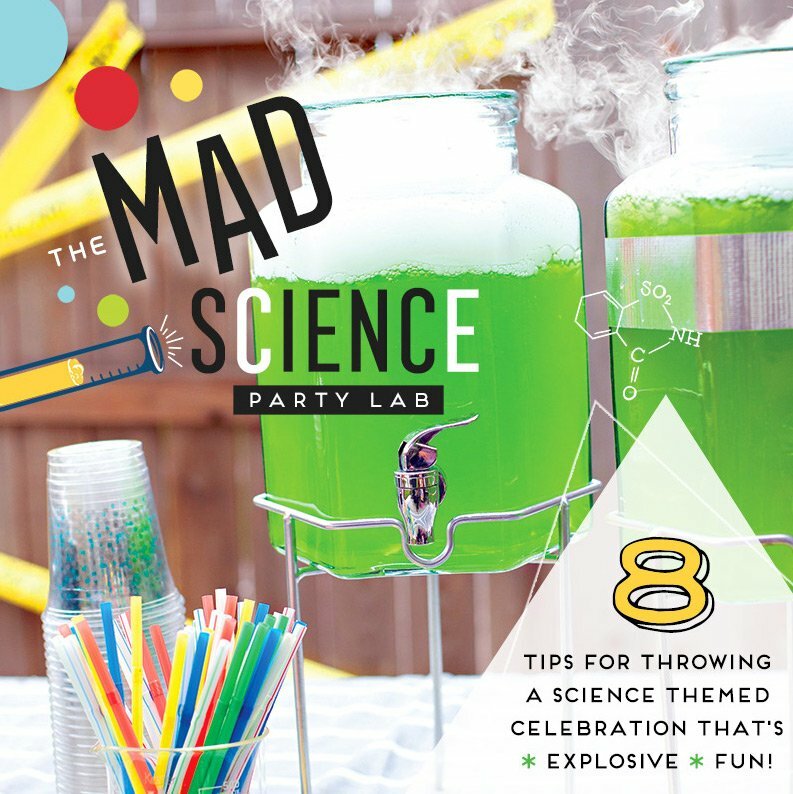 ;) Nicole Gould of Million Dollar $mile Celebrations always knows how to share her endless bouts of creativity in style, while being an inspirational mom and charitable citizen at the same time! 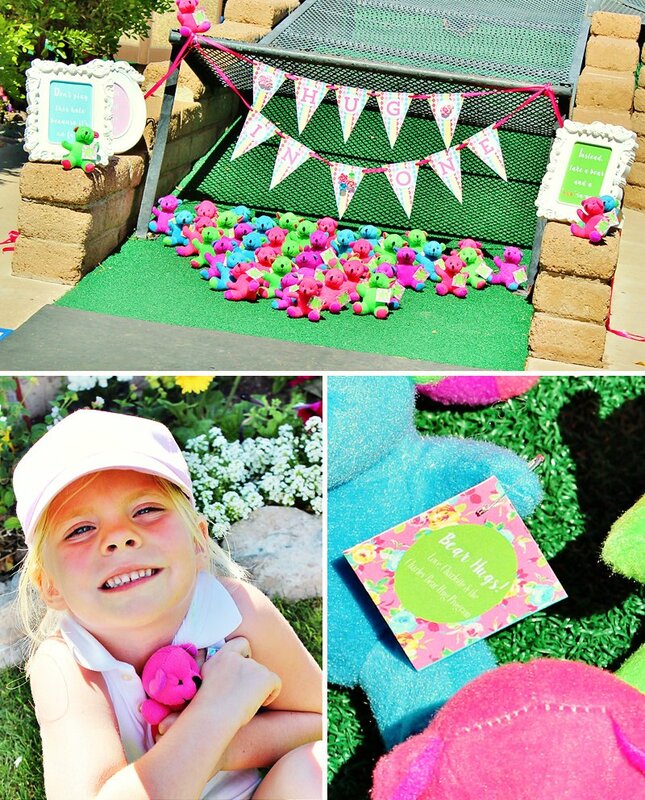 This time she channeled her talents for a darling Pink & Preppy Mini Golf Party that raised $1,000 for the Bear Hug Program at Barrow Cleft & Craniofacial Center (her daughter Charlotte’s personal project that you can read more about here)! 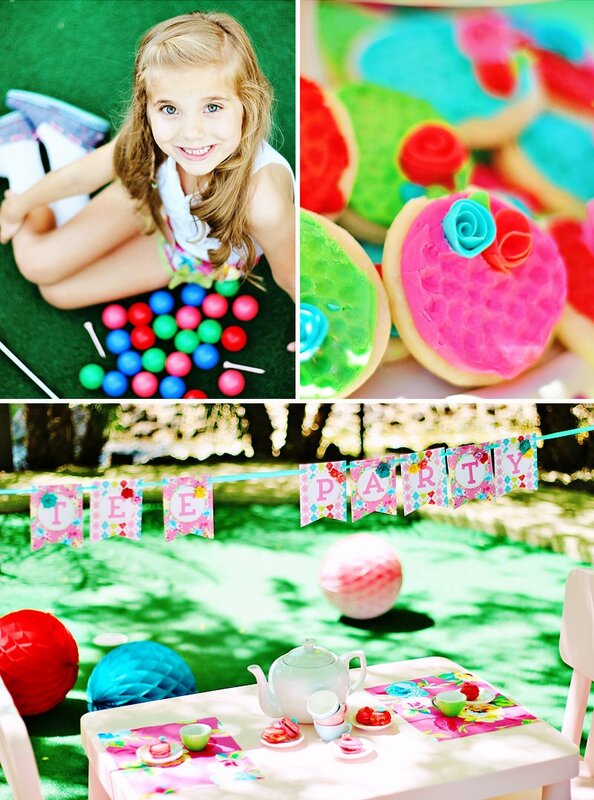 Scroll down to check out all the colorful details – from a floral-bedecked TEE party to edible golf balls and darling “Hug-In-One” teddy bear favors! 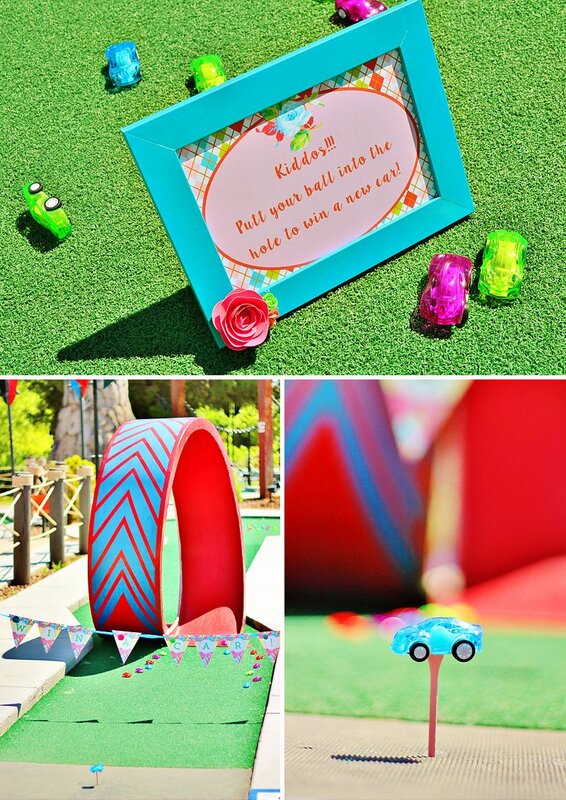 Pose FORE a photo booth: pink instant camera & putt-putt party props! 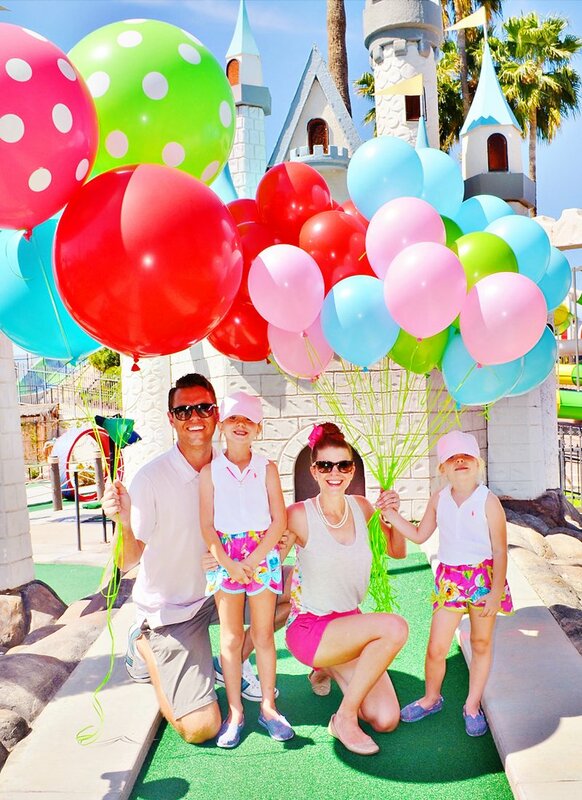 What’s more fun than putt-putt golf? NOTHING!! 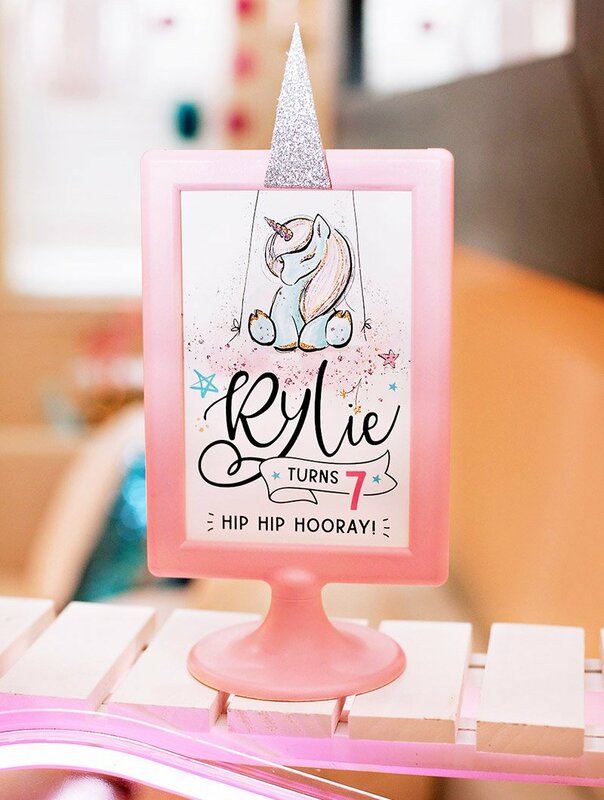 Except for maybe a miniature golf party where guests won cars, stopped for a cup of TEE, posed FORE picture at a photo booth in front of a windmill, scored a ‘hug-in-one’, putted with Princess Ariel, and raised $1,000 for a very special birthday girl’s charitable program. 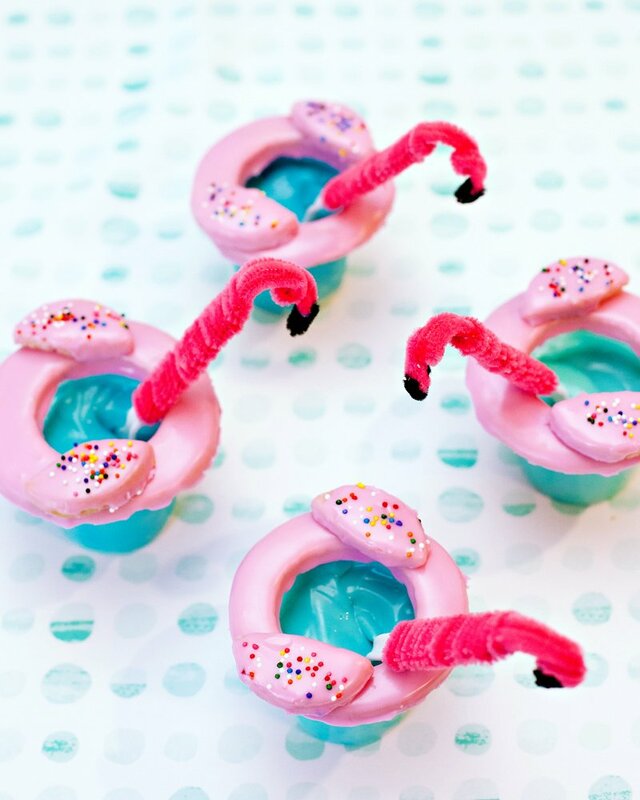 Now, that sounds like a pretty perfect putt-putt party! Charlotte invited all her family and friends to test their skills on a perfect March day. 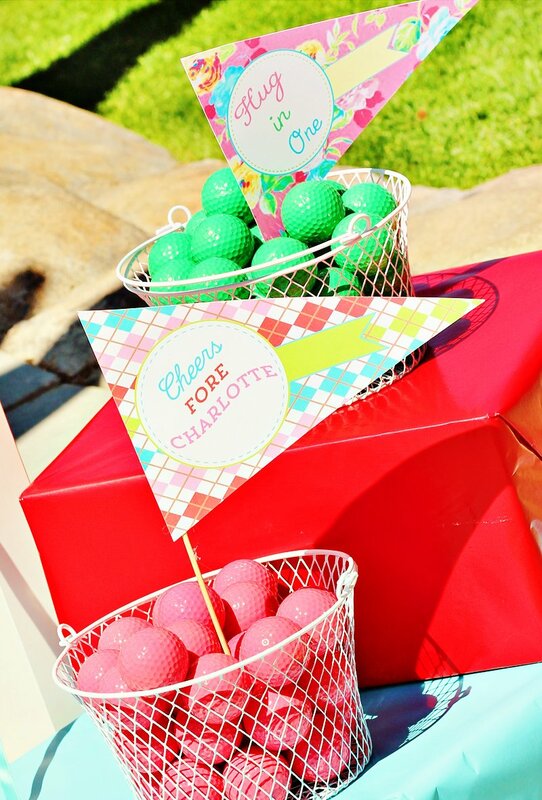 Spring was in the air as we transformed the entire course into a party mixing floral and argyle patterns and brightly colored décor. 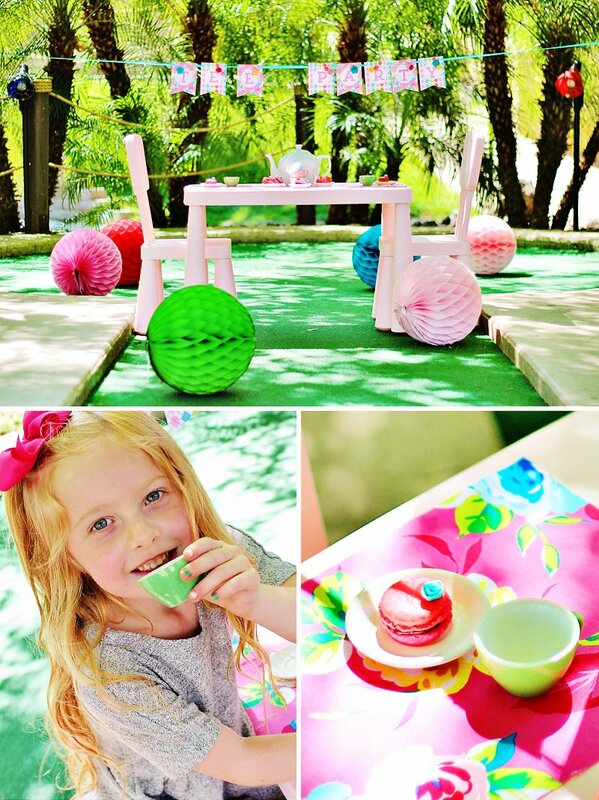 As guests arrived, they were directed to swing by the 4th hole to celebrate with treats at the tee. 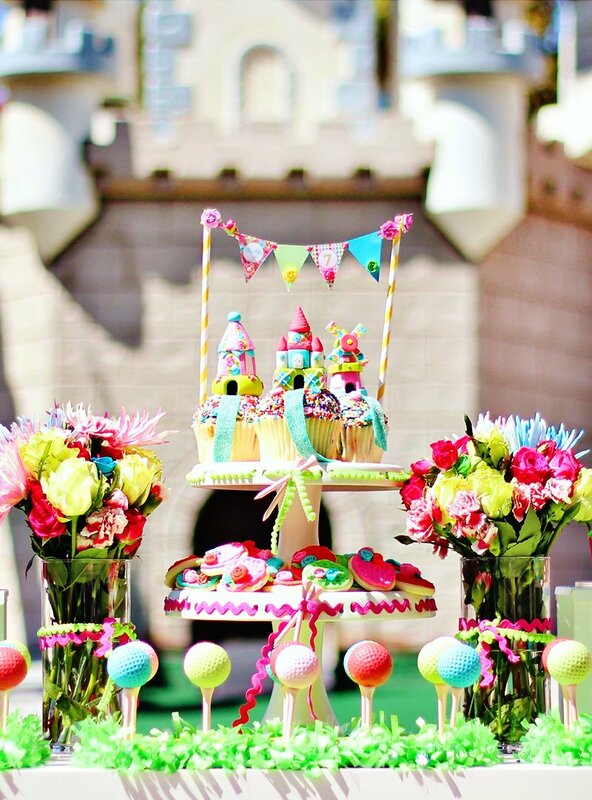 Tee’d up perfectly in front of the majestic castle obstacle, a dreamy dessert table featured miniature golf related cookies, cupcakes, and cake balls. 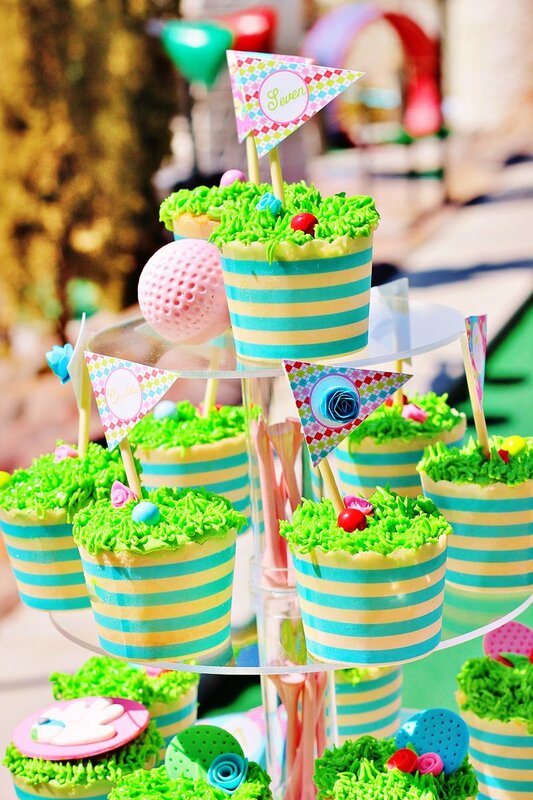 All ready for the tee-shot, really yummy and really realistic golf cake balls lined the dessert table. 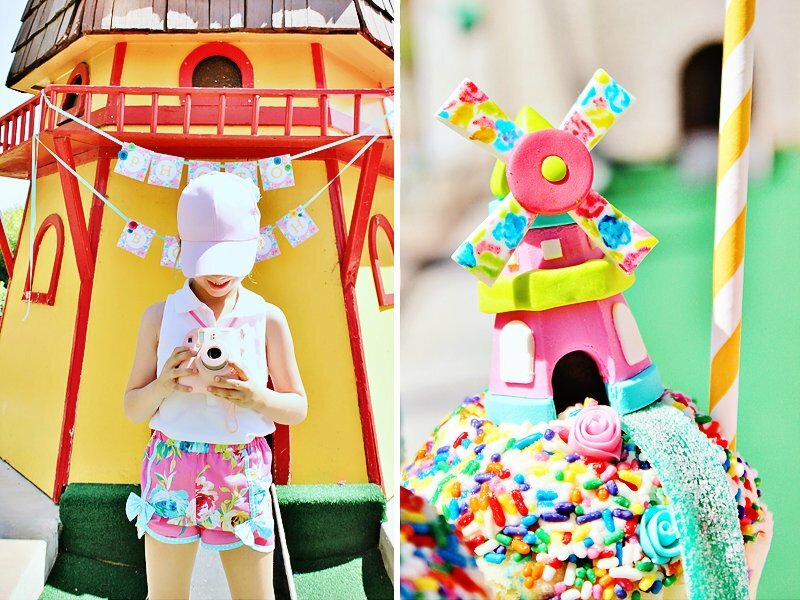 Towers of cupcakes featured custom fondant details creatively showcasing pretty little flowers and gorgeous little golf details. Bite-size cookies with rolled-fondant flowers and real floral details made the display way above par in a very good way! Exactly at 12:30 pm, the foursomes (each family) were handed a caddy basket holding water, a score card & a teeny, tiny, teal pencil, and their hole assignment for the shotgun start (FORE the non-golfers out there, each family started at a different hole so no one waited to golf and everyone rotated around the course throughout the celebration)! 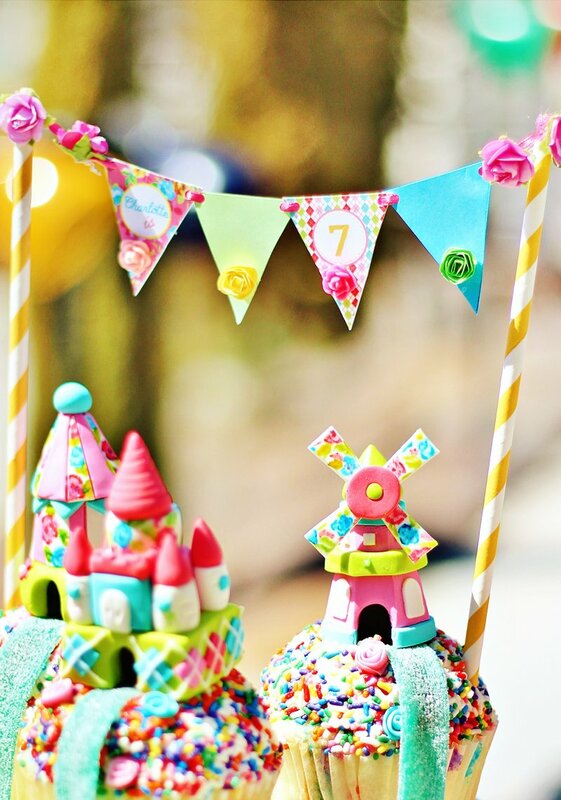 While on the course, golfers ran into the usual mini golf obstacles… closing doors on cottages, water traps, bulls-eye shots… as well as, some festive and fun birthday bunkers! Golfers who putted their ball into hole #7 won a CAR!!! Yes, tiny cars waited on the far side of the race loopty-loop near the cup. It’s fun when EVERYONE wins!! 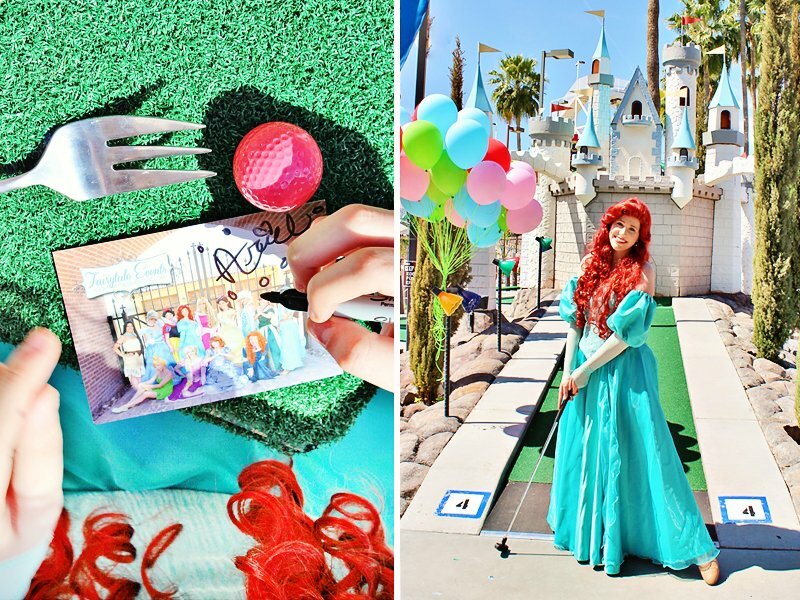 Imagine walking up to the castle obstacle to find Princess Ariel waiting for you to cheer on your putt and pose for a picture. 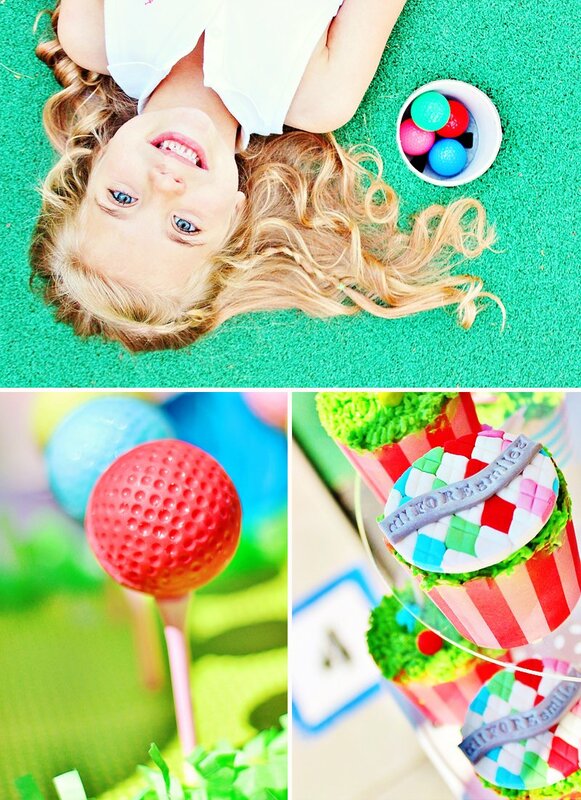 Singing, fish faces, and hair brushing with a dinglehopper were also spotted on this green! 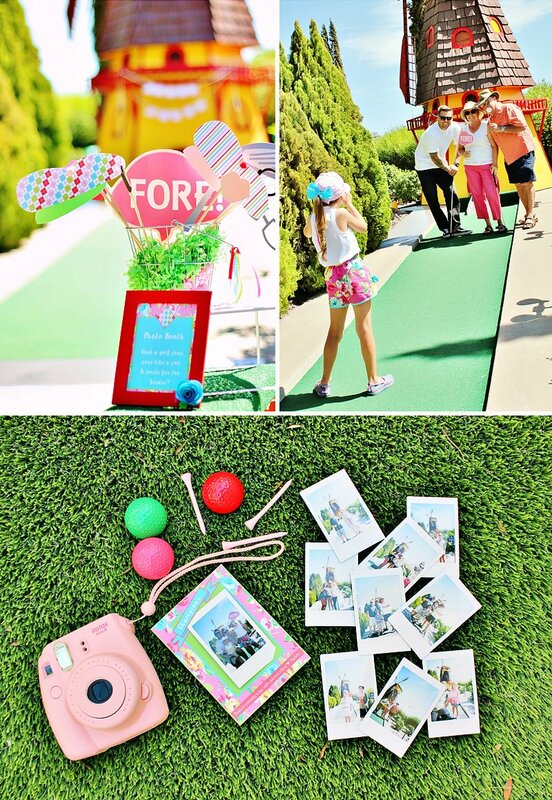 As guests completed the front nine, they stopped and posed FORE a photo booth involving an adorable pink instant camera and lots of fun putt-putt props! Just in time for a break and refreshment, a prim and proper TEE party waited in the shade. 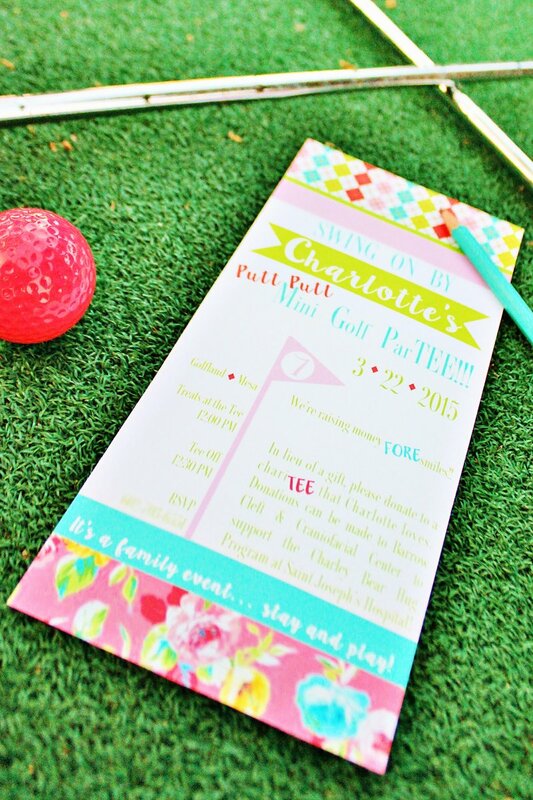 Normally hole #18 means the end of the game and the end of the fun, but NOT when you’re at Charlotte’s party. Many guests had more holes to visit, so guests gladly marked a one on their score card, picked up a tiny bear favor, and earned a “hug-in-one”. These tiny bears served as a thank you for guests donating to the birthday girl’s charitable effort… the Charley Bear Hug Program at Barrow Cleft & Craniofacial Center at St. Joseph’s Hospital. 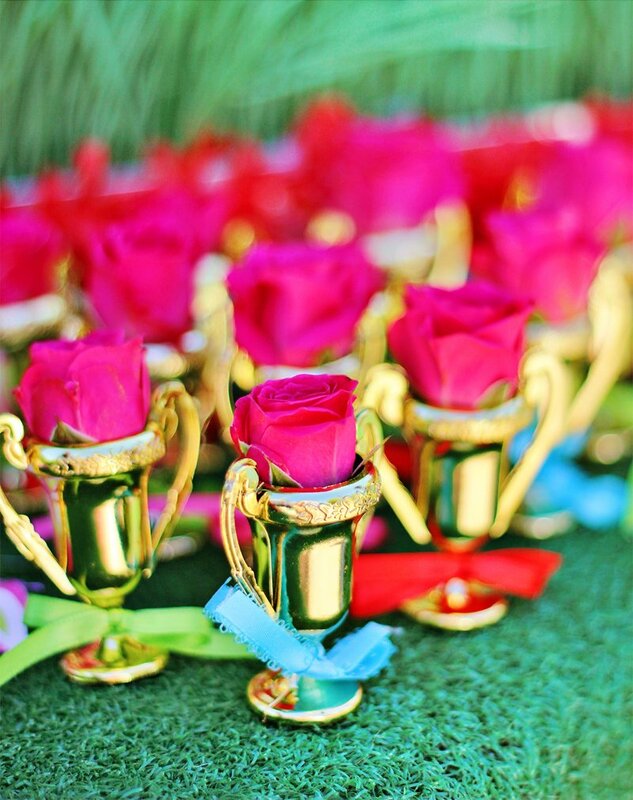 At the end of the round, guest took home a “miniature” trophy for their efforts on the “miniature” course. 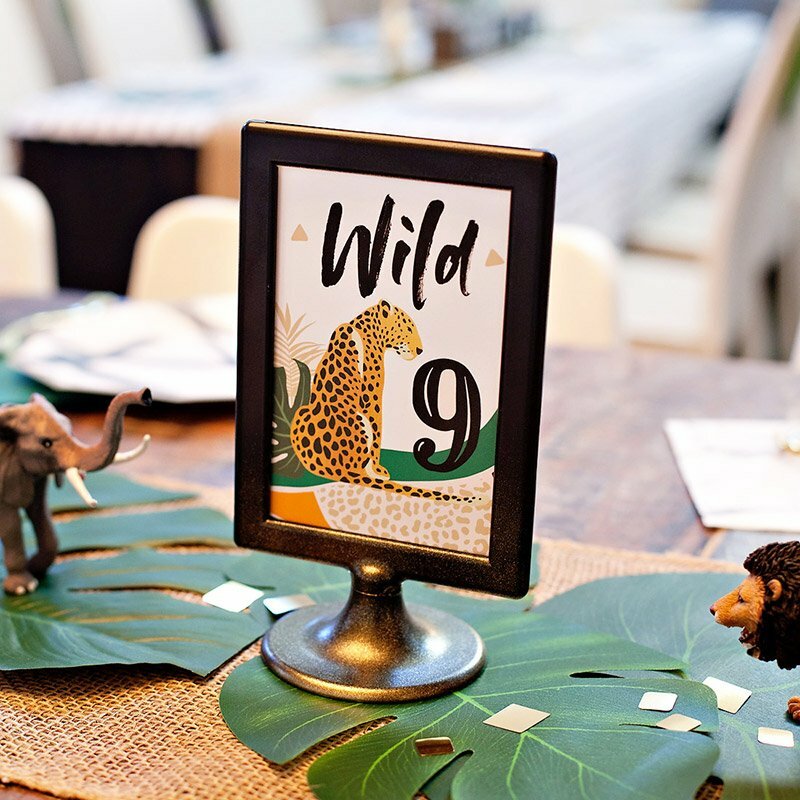 Everyone was a winner, but the champion just happens to be the seven-year-old who asked guests to bring donations instead of gifts for a program she created which gives teddy bears & support to families of newborns born with cleft lips and/or palates just like her! Now that’s a hole in one!! Thanks FORE sharing!!! You gals are certainly above par!! !